A lawn feels soft and cool under our feet, gives children and pets a place to play, and is an ideal spot for a summer picnic. Even so, lawns use up a lot of resources and can be very high maintenance, especially when it comes to watering. 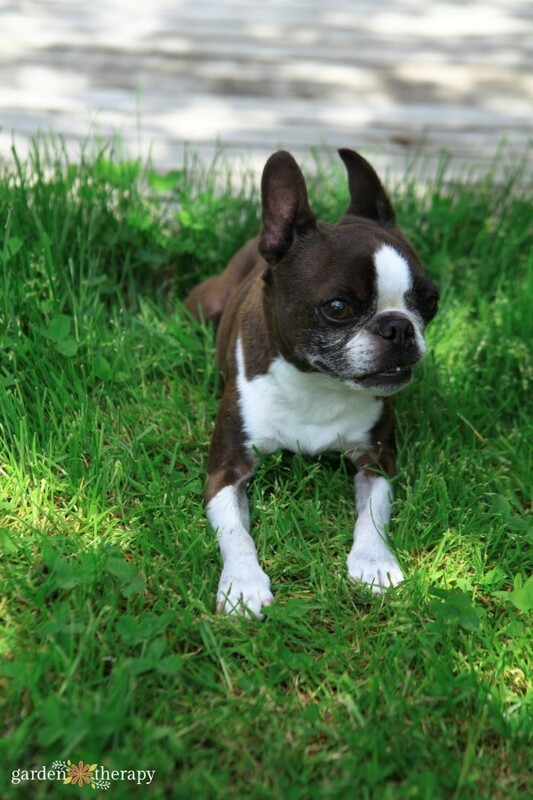 Lawns can be water hogs! Watering gardens and lawns has become a hot topic in the face of changes in climate conditions and unheard of periods of drought. Water resources are dwindling and, according to a recent study conducted by UNESCO, if water consumption continues at its current rate 50 billion people will have scarce access to water by the year 2050. Many people are becoming aware of ways to conserve water and there is no subject as heated as watering lawns. If you’re going to have a lawn on your property, then you can save both water and effort by understanding the science behind how lawn grows, and adopting a few tips for your home garden. This post is sponsored by Gilmour, who also provided me with the sprinklers and watering tools shown in this post. 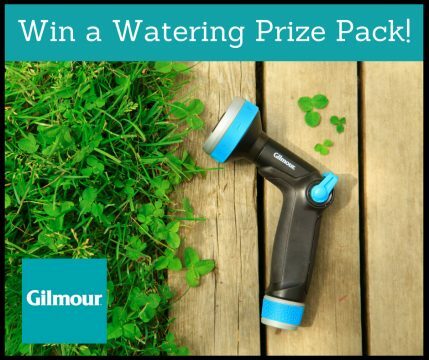 Gilmour, a leader in quality watering tools, provides durable products with quality, efficiency and control features to make gardening and lawn care easier than ever. Gilmour’s hoses, nozzles, and sprinklers work seamlessly together to create a watering system that is perfect for your home garden. Check out the giveaway at the end of this post for a chance to win your own awesome watering tools. Each square foot of turf can be full of tens to hundreds of thirsty turf grass plants, each one aggressively competing for resources with its neighbors. Each plant is gobbling up the water, sun, and soil nutrients as quickly as possible to thrive in the space and outperform their neighbors. Then they set seed and drop them just below so that the next generation can replace them when they get burnt out. 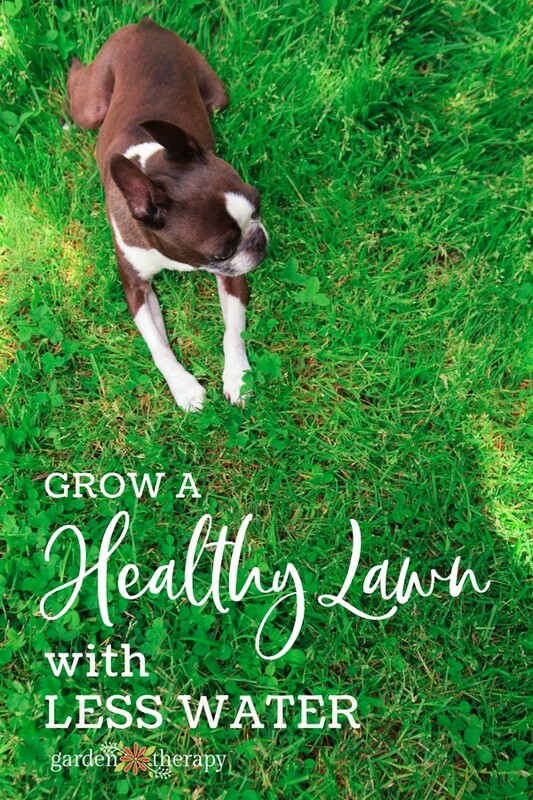 You can read more about how to give them the sun and soil nutrients they need in my other post on lawn care, but for now we will look at water. The tips I’ll share with you today might have some of you thinking that I’m off my rocker! Like when I suggest you let the lawn die or that you plant weed seeds. But please don’t click away too fast. There’s a method to my madness, I promise. 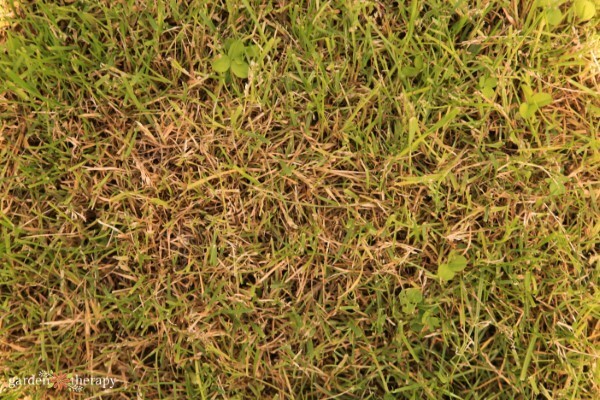 Read on to grow the best lawn you’ve ever had with far less effort than you thought possible. If you throw a sprinkler on your lawn every day, you are actually doing your lawn more harm than good. It teaches the roots that water is available right at the surface and so the roots stay there and snack on a bit of water every day. These spoiled plants can’t handle drought nearly as well as plants that have been watered deeply only once or twice a week, whose roots push strongly down through the soil to grab water reserves. Encouraging deep roots allows you to wait longer between watering. It also means you can water less because water deep in the soil doesn’t evaporate into the air like it does in the top soil. What you can do: make a watering gauge by gluing a measuring cup onto a garden stake and placing it in your garden. When it rains or you water, you can measure the inches of water that have fallen on your soil. Lawns need 1-1 ½” of water per week. If your neighborhood’s watering restrictions allow it, watering in the early morning means less evaporation and water waste than in the middle of the day when the hot sun and dry air are a moisture magnet. What you can do: set an automatic watering timer to start watering in the wee hours of the morning and stop by 8:00 or 9:00 A.M. Note: to figure out how much time you need to water for, set up your watering gauge in the lawn area and run the sprinkler for 15 minutes. 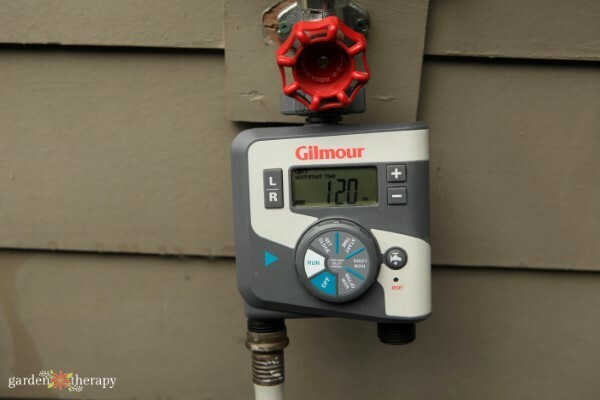 Measure how much water you have collected and extend the time so that your gauge will fill to 1-1 ½”for weekly watering or ½” –¾”for biweekly watering. The more water you shoot into the air, the less water actually gets to the plants. 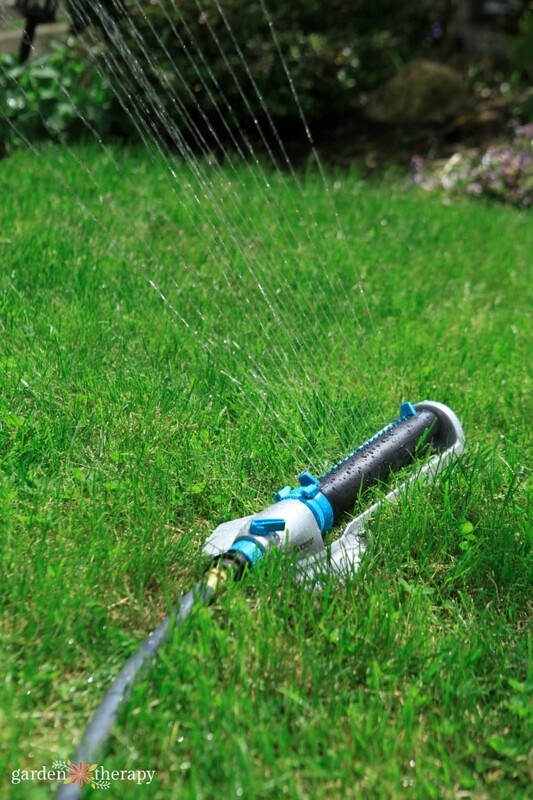 Make a plan for what sprinkler system you need to most efficiently water your lawn. 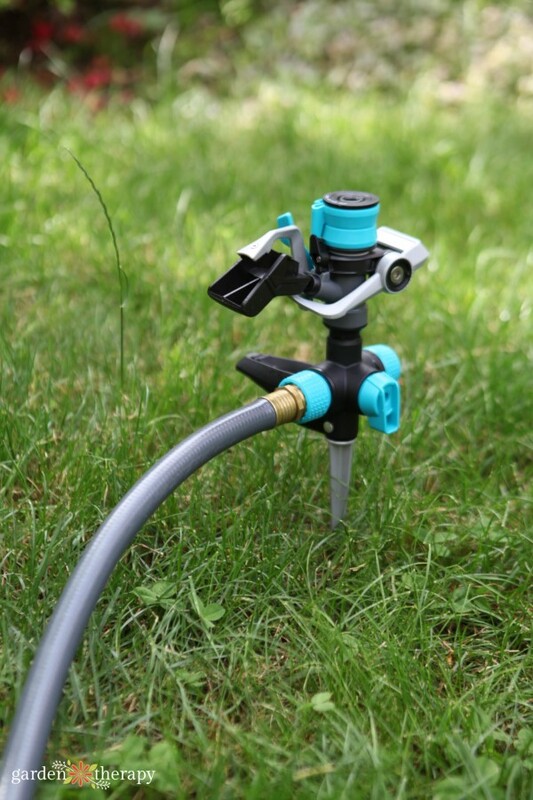 Set up your sprinkler settings and test the reach with the watering gauge. What you can do: choose the best sprinkler for your lawn shape to water only the lawn, not wasting water on sidewalks and fences. 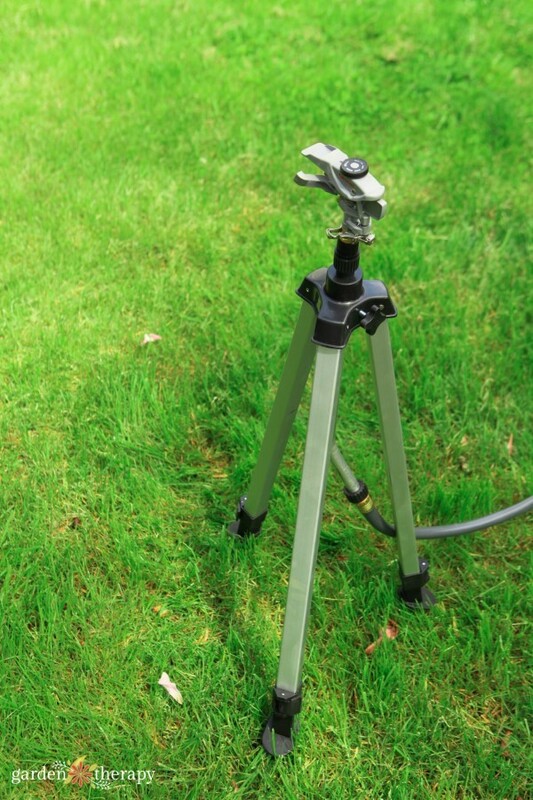 A Tripod Sprinkler directs water far and down and is ideal to cover a large lawn at once (up to 43-ft. spray distance; 5,800 square feet). For average lawns, a Circular Sprinkler gives you 360-degree coverage when placed in the center of a circular lawn. A Heavy Duty Rectangular Sprinkler gives you independent length and width control for rectangular and square lawns. For smaller areas, hand watering is a meditative and relaxing way to enjoy the outdoors. 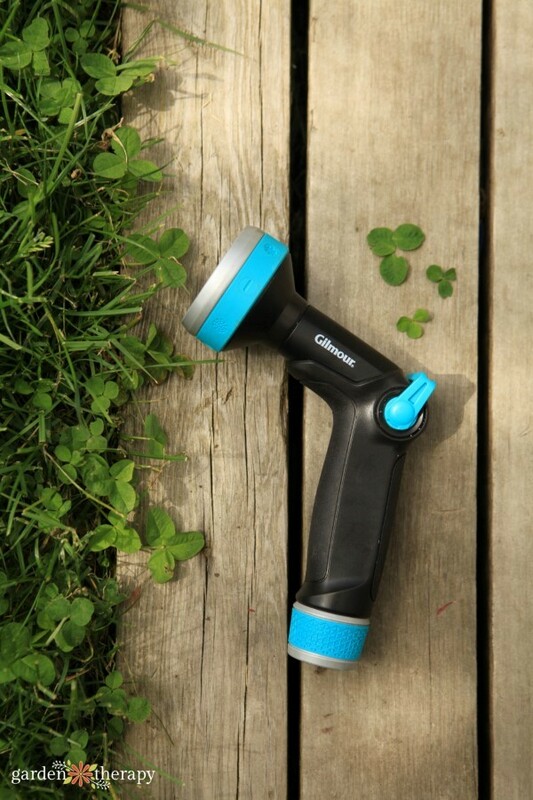 Use an ergonomic Thumb Control Watering Nozzle so that you can direct water just where it’s needed and keep your hands from getting sore! Turf grasses need a bit of a break in hot, dry weather. As such, they naturally go dormant in the heat of summer. Dormancy means that the leaves above turn brown and wilt to conserve energy in the roots below. The plants may look dead, but when the weather cools down, the grass will grow back stronger than ever, because it followed its natural life cycle. What you can do: if you live in an area where there are defined seasons, stop watering your lawn in the hottest months of the year. Let the plants go dormant and you’ll not only a save a ton of water, but greatly reduce your workload as well—keeping lawn green when its natural state is dormancy requires constant watering and mowing! It’s exhausting for the gardeners and the lawn. I’ve not only stopped removing weeds from my lawn, but I’ve started adding them, too! Weeds can also be great lawn additions, just have a look at a park landscape. It will be full of low-growing, drought-tolerant wildflowers and other “weeds” mixed in with the grasses. Weeds like clover and violets are soft and green like grass, you can mow them, walk on them, and, in true weed style, they are aggressive growers. What you can do: adding these plants to your turf mix helps to reduce water because, well, you know weeds! They can grow anywhere. I have been adding microclover to my lawn seed mix at 2% over the years, and I love the results. Keep the plants mowed and they will stay small (less than 1″), or let them naturalize and get a bit bigger. 1 x Flexogen® Super Duty Hose which maximizes durability and kink resistance for superior all-around performance. 1 x Thumb Control Watering Nozzle with Swivel Connect. The swivel connection increases mobility, allowing nozzle to pivot without twisting or kinking hose. Refined patterns with 8 clearly marked spray settings and one-turn adjustment to move from jet to rinse. Be sure you are signed up for our newsletter to get news and special offers we don’t share anywhere else. This contest is open to residents of the continental US and Canada, except Quebec and where prohibited. This Contest is now closed. Congratulations to our winner, Cheryl, who nominated her son and daughter-in-law, who just bought their first house and have a lot of yard work ahead of them, to win the second watering prize pack. Thanks for sharing the love, Cheryl! I’m nominating Prarie Crossing community gardens. It’s good to drink when your thirsty, and to eat when your hungry. Nothing beats growing your own food.